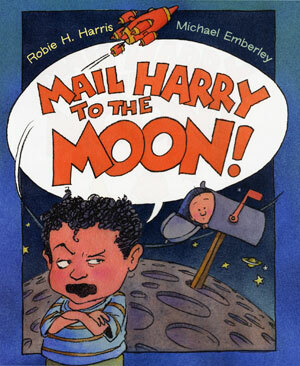 Robie and Michael Emberley’s picture book MAIL HARRY TO THE MOON! was the winner of the 2008 Irma S. and James H. Black Award For Excellence in Children’s Literature awarded by the Bank Street College of Education, New York City. Read about the award here. Robie and Michael were thrilled to know that children were a vital part of naming MAIL HARRY TO THE MOON! the best picture book of 2008. Over the course of many weeks, more than 2,500 children around the country read, examined, discussed, and re-read the four nominated picture books before they voted on the winning book. This story, told by a young boy, talks about what life was like before the birth of his new brother, Harry. 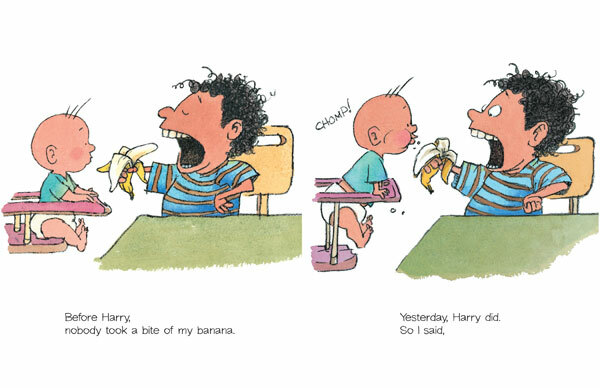 When Harry takes a bite of his banana, his older brother says, “Throw Harry in the trash!” When Harry screams in the middle of the night, his older brother screams back, “Mail Harry to the Moon!” The next morning, when Harry’s brother wakes up, he cannot find Harry — necessitating a trip to the moon. -Selected as a School Library Journal Best Book of the Year for 2008. 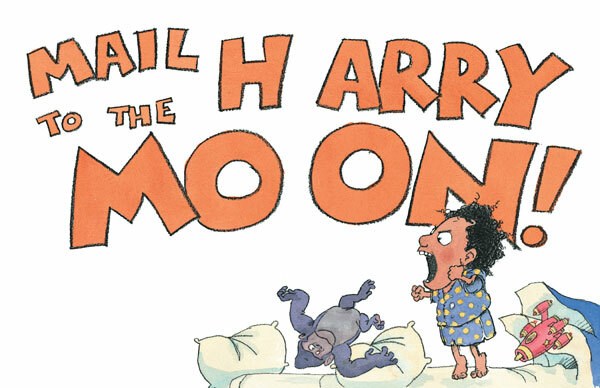 “Before Harry, there was ME!” says the smiling boy in Robie Harris’ marvelous picture book “Mail Harry to the Moon!” It’s the first of two new works by the author of “It’s Perfectly Normal.” Both books are engaging read-alouds for tots with tempers — and, we hope, a budding sense of humor. In “Moon,” a new big brother is struggling for attention while Mom and Grandma hover over the newborn, Harry. Author Harris nails big brother’s emotional tirades, but Michael Emberley nearly steals the show with his funny illustrations. His cartoon-like drawings in bright colors capture every nuance in big brother’s angry eyes, slumped shoulders and gritted teeth, telegraphing his mondo irritation over baby vomit on his face, baby in Grandma’s lap and baby screaming. He shouts about tossing Harry into a trash can or flushing him down the toilet. However, when he wakes up and there are no Harry noises, he looks worried. Although Harris’ resolution may be more pie in the sky than one could expect, it’s an ending every parent would love. Equally sensitive is Harris’ book about Leo, an attention-hungry boy who explodes with words he instantly regrets. It happens in “The Day Leo Said I Hate You!”. The day begins with Leo hearing only “No!” from his mom, who’s working at her computer. Her admonishments come after he puts green beans in the fishbowl and squeezes toothpaste into the toilet bowl. Thoroughly frustrated, Leo retreats to his room and draws a mad Mom on his wall. When he unleashes the three dreadful words, he’s shocked. So is his mom, but they talk their way to a loving resolution. Molly Bang’s colorful, expressive collages perfectly match Harris’ emotional text. “The title might call Ralph Cramden to mind, admonishing Alice, “To da moon, Alice…to da moon.” But only grandparents reading aloud would be aware of that, of course. For kids, Harris’s story resonates a deep personal tone with anyone (yes, adults, too) who ever had a sibling. Don’t lie, everyone at some time, considered the nicety of one’s sibling being removed to another galaxy, far away. This is a good-quality book – an important consideration in children’s reading material. Good fonts, good color and illustrations. Michael Emberley’s engaging cartoony style puts the mood and emotions right there on the page with a sense of wry amusement. The simple story sees an older brother confused about changes at home when a new baby scarfs up the spotlight in every family scene. Little by little, without heavy-handedness, author and illustrator show readers the other side of being a sibling – it can be fun and a source of pride. “Before Harry was born, There was ME! Now there’s me. And Harry. 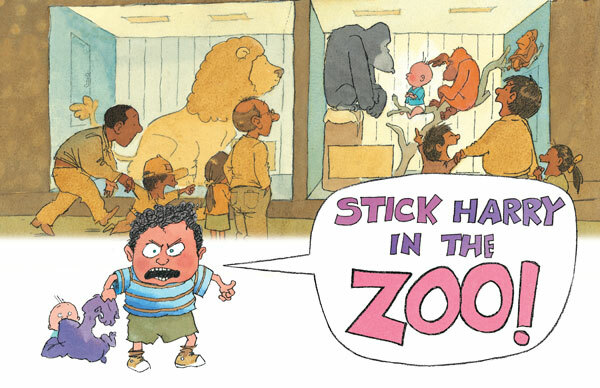 Thus begins this delightful picture book about sibling rivalry. Our little protagonist is extremely upset because now that his baby brother has arrived, everything has changed and no one seems to be paying much attention to him. In fact, Harry wants to steal the whole show! Thus different ideas pops into the protagonist’s mind — throwing Harry down the toilet, sticking Harry in the zoo, or even better — mailing Harry to the moon! But then one morning, Harry disappears and is nowhere to be found. Now it’s up to his jealous older brother — who, by the way, doesn’t seem too jealous anymore — to find him. Mail Harry to the Moon is a cute and enjoyable book for very young readers. It’s also a nice book to read to young children ages 2 and up. The writing is engaging and the illustrations, simple yet wacky and whimsical, go well with the story. This is a book that will especially appeal to little boys, and one that has an important message for the family. Often young children get jealous with the arrival of a new baby. “This is one of the most fun children’s books I’ve ever read! Robie Harris’ simple words convey a wealth of emotions that perfectly captures both Harry’s innocence, and big brother’s ire and later remorse. All with charming and irresistible humor. There’s nothing preachy about this at all. In fact, since the entire thing is told from the big brother’s point of view, readers are compelled to at first sympathize and later empathize with the older brother’s feelings. 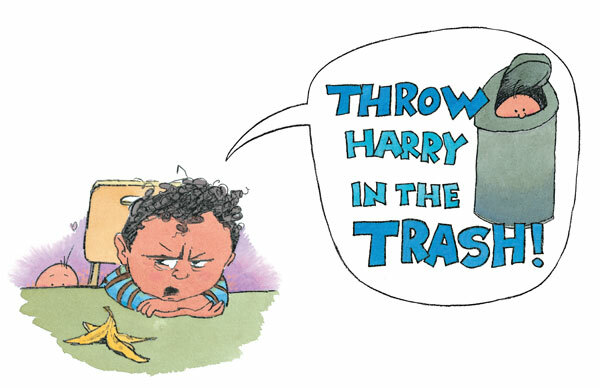 When Harry bites his banana, spits up, chews big brother’s gorilla, takes over Grandma’s lap, and screams all night, our irritated protagonist wants to: throw baby brother in the trash; flush him down the toilet; stick him in the zoo; put him ‘back inside Mommy’; and ‘mail Harry to the moon!’ But when Harry is nowhere to be found in the morning, his brother searches all the places he’d wished him, and even launches an imaginative lunar rescue. “Mail Harry to the Moon is an adorable book. I wish I’d have had it when my children were little. My oldest did not like it at all when his baby sister came home from the hospital. Before Harry was born, There was ME! This little guy is not at all happy with the changes in the family since little brother arrived … and he’s come up with plenty of ideas of getting things back to the way they were. But then one morning, Harry disappears and is nowhere to be found. This helps the older brother see how empty life would be without Harry.